"'Aging in place' refers to living where you have lived for years, using products, services, and conveniences which allow you to remain at home as circumstances change. In other words, you continue to live in the home of your choice safely and independently as you get older," (aginginplace.com). Research has shown that by 2015 the United State will be home to over 71 million persons over the age of 50. According to the White House Council on Aging (WHCoA), "The average age of the population will grow higher as people will live longer; this will include an increase in the number of centenarians" (a person who has reached the age of 100). "Age in place" design was established to alleviate the strain and demand on aging adults as well as handicapped children and adults. Maintaining a safe and healthy home environment is simple now that small adjustments can be made to provide simple transitions from room to room, providing the homeowner with the utmost comfort. Creating a home to account for the needs of the elderly is a relatively simple process. By providing a few alterations, Mountain Construction can make your entire home elderly/handicap accessible. Home modifications may include installation of entry ramps, grab bars, elevators, wider doorways, bathroom and kitchen redesigns. With these additions to your home, you can remain in your home safely, independently, and comfortably. For a new home, floor plans can be created to provide extra room for maneuverability. The majority of accidents involving an elderly person occur in the bathroom. 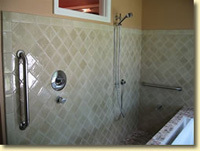 Concerning bathing, we can provide Walk-in Tubs, Barrier Free Showers, Shower Seats, etc. 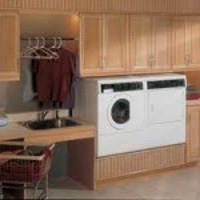 Other adjustment such as sensor activated faucets, lower height vanity and countertops, anti-slip floor covering, and widened doors are a few changes that can be made to ease the burden on an aging person. Rollout and pull down shelving can be added to cabinets and a pantry as well as Lower-Than-Standard Height (LSH) installation for countertops and cabinets. 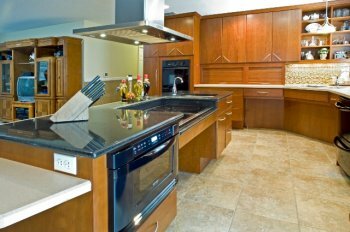 Sinks and cooktops throughout a kitchen can also be customized to accommodate "anti-scald valves," flat cooktop surface, and front mount controls for both sinks and cooktops. Universal changes may include ramps, widened doorframes, increased clearing distance in all rooms, and LSH shelving. "Residential design for aging in place encourages inclusive rather than exclusive living. Effective solutions discourage the fear of being alone, helpless, or a burden on family and friends." (xv Residential) Here at Mountain Construction, will we remodel your existing home to your personalized needs, or we can build your dream home that will not only meet but also exceed your expectations. And with the "age in place" additions you can enjoy your dream home for many years to come. 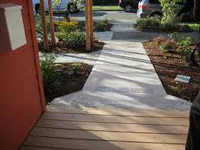 For more information or a free consultation from MOUNTAIN CONSTRUCTION please CONTACT US.